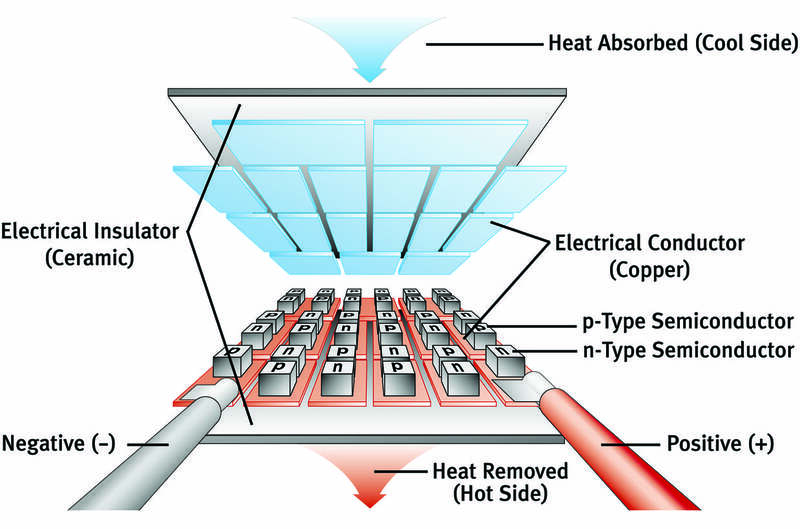 Thermoelectric (TE) devices are small solid-state heat pumps consisting of a matrix of thermoelectric chips connected in series electrically, and connected in parallel thermally. Each chip consists of p-type and n-type semiconductor pillars positioned between two ceramic plates. These plates provide a rigid mounting surface and electrical insulation between the heat sink and the process being cooled. Peltier discovered that heat is released or absorbed when two dissimilar materials that conduct electrical current are joined. A positive voltage applied to the n-type material drives electrons from the p-type to the n-type material, and then back to the voltage supply. The temperature on the cold side decreases as heat is absorbed. By reversing the polarity, the hot side becomes cold, and vice versa. Cooling capacity is proportional to the number of chips and the current being supplied.